Birthday reminder workflow in CRM Note : Most of this is for CRM 2011 but it does work in CRM 2013 as well. Also most of my information I got from these sites below done by Michael Scott he explains in detail how to accomplish this but I changed my JScript a little.... Workflows are a great feature in Microsoft Dynamics CRM. They are highly customizable to fit your business needs. Workflows are also easy to copy, should you run into an instance where you wish to replicate the workflow functionality to another separate instance. 8/01/2015�� If I just call business process workflow on custom button click then record automatically transfer from one entity to another entity like defined in Business Process.... Workflows can be constructed from built-in activities as well as from custom activities. This topics in this section step through creating a workflow that uses both built-in activities such as the Flowchart activity, and the custom activities from the previous How to: Create an Activity topic. So that I can create a button on the ribbon in CRM to start a workflow. The idea being that the user will fill in part of the form and then request approval. The idea being that the user will fill in part of the form and then request approval. how to create a work schedule on access I need to use the same fetch xml in custom workflow and get the result. Based on result, I need to create the task activity on workflow. Based on result, I need to create the task activity on workflow. The New Features of CRM 2015 Update 1 & How to use them May 14, 2015 Add comment The new CRM 2015 update is upon us and you can now play with it yourself by creating a free trial of CRM 2015 which I recommend you doing now and finish reading this post after it�s set up. 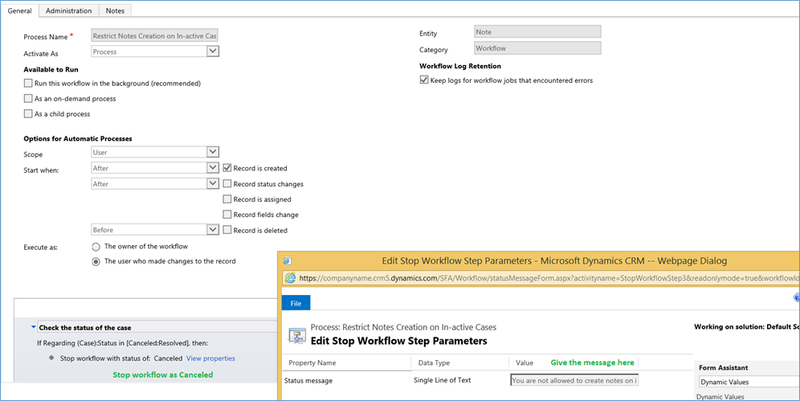 Creating a workflow process for Product Order in CRM Dynamic 2015 The issue I'm running into is when the user adds an product to the order via Product & Lot grid, they refresh the grid and save, then it doesn't trigger the email action. 13/11/2014�� Alternatively, you could create a new hidden checkbox field in Cases, have the Workflow condition only run when the checkbox is set to No, and include an action in the Workflow to set the value to Yes after it sends the first email.